• Utilises Dynamo, Solar, USB charging. 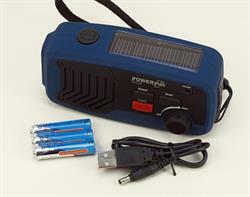 • Integrated flashlight and personal alarm. Buying this product will earn 250 Loyalty Points. Be the first to submit a review for the PowerPlus Panther Dynamo & Solar FM Powered Radio.